Wanted to make a post regarding this problem for a while now. Maybe i'm just unlucky but even if i spend a ton of mushrooms it seems i can't get right potions for my class. Even with lvl 16 aura on uk server and lvl 14 aura on ro server. This happens to me since i restarted playing in january. I know i'm unlucky but still... high level aura seems to do worse in my case. Same thing happens with epic items. Spent like 200 shrooms few months ago on uk server and got like 3-4 epics while it was an epic event weekend. Every time i visit the Magic Shop i feel like i'm entering a shop, have my pockets full of cash but nothing to buy... and i know i will never enter that shop for the rest of my life. So i'm asking if the chance on getting right potions for each class can be tweaked a bit. 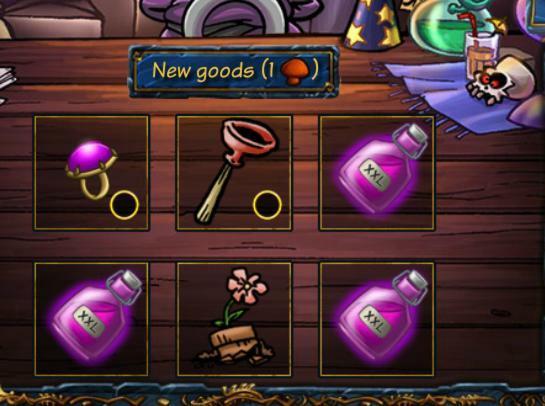 PS> As a suggestion... now there are 6 items in magic shop. Maybe the number of items can be raised to 10, at least for the Magic Shop... that would be awesome. Last edited by Valkyra; 24th November 2015 at 05:14 AM. I use mushrooms at every epic week end in magic shop for new potions. You have been unlucky then. Potions are (just like items) randomly generated. Sometimes you are unlucky, sometimes you are lucky. It's also important to buy all potions even if you do not need them...as a new item is randomly generated upon when buying the potion. Potions, like epics, have a % to be found in shop. Are you sure that ALL potions have the same %? Seems to me the higher your toilet aura gets you only get crap potions that are not for your class. I thought aura increases the chance to get potions FOR YOUR CLASS but it seems i got it wrong. Still i would apreciate if my suggestion to increase the item number that are sold in magic shop will be heard by the devs or the person in charge. Last edited by Valkyra; 24th November 2015 at 02:21 PM. I also have a suggestion. Add some extra type of potions made by the witch besides the spell scrolls like potions who add weapendamage, reactionboost or higher than 50% luck limit. This way we have more choices in strategy than always the same 3 kind of potions. Maybe move the sales of potions from the magicshop to the witch, so magicshop only magic items and witch only scrolls and potions. Last edited by Solarking; 24th November 2015 at 10:35 PM. @Solarking ... That's a brilliant idea!! !